Dec 1 Fat Loser: Bread Makes You Fat!? So, you had all your turkey and pumpkin pie over the weekend. All the left overs are gone from your fridge and you are ready to start eating like a normal person again. The only real question is, how do normal people eat? What are the things that I should be cutting from my diet? How many bacon wrapped deep fried KFC Double Downs is to many? Some of these are good questions. It would be very easy for me to sit here and give you a list of all the things you can eat from now on. I could plan out all your meals for the rest of your life for you, but in the end you wouldn’t follow my plan. Damn you arrogant bastards. At the end of the day, it is you that has to teach yourself what eat because only you know what you can and can’t live without. All I can do is help you to focus you inner sloth demon and work on making some major life changes. So, where do we start? Lets face facts. Your fat because you consume more calories in a day then your body can burn. The easiest way to solve this to change that. Basically, stop eating so much. The trick is deciding how best to do that. I know I had to reconcile my desire to lose wait with my microwave pizza addiction. What I found out was that I didn’t have to stop eating them. I just changed things up. It used to be for lunch I would normally have these Red Baron microwave mini pizza thing. They were good, but I found out that they were 470 calories. That is a lot of calories for something that didn’t fill me up all that much. Being concerned enough to want to change, but not enough to stop eating microwave food, I switched to the Red Baron french bread pizzas. They were a bit more filling an less calories. Now I just got for the individual slices they sell. They are so good! I didn’t really intend for this to turn into a commercial for Red Baron, but I though that story would be applicable. I changed my diet around enough to start helping me with my weight loss without giving up want I wanted to eat. Although, If you are as fat as I was you have to make some sacrifices. The biggest deal at first was Mountain Dew. I must have drank 6 to 8 cans of it a day. I sucked it down so fast that I really didn’t even get a chance to taste it. My first weight loss step was cutting down on soda and eventually I stopped drinking it all together. Now when I try and drink it I wonder how I ever did before. I just can’t seem to enjoy the taste anymore. All in all, soda was an easy change, but where I really hit a wall was bread. I Love BREAD! If I could live of a diet of pumpkin pie, pizza, and bread, without gaining weight I would start today. 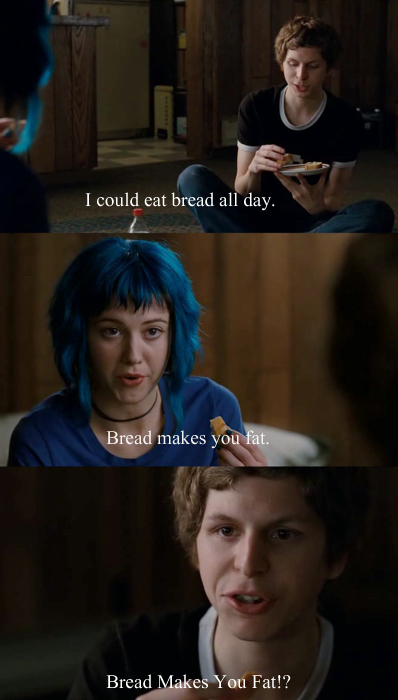 Sadly, bread does make you fat. It’s one of the few things I just can’t have in the house anymore. Of all the things I have cut back on or stopped eating, bread is the one thing I miss the most. I wish I could eat more of it, but I have a problem with eating. It’s why I’m such a fatty. I tell you all of this so that you too can understand the sacrifices it is going to take to get towards you target weight. It starts with simple changes at first, but the more weight you lose the harder it gets and the farther you have to go. You have to be the one that figures out what those things are that need to be cut from your diet. No one else knows your eating habits like you do. Actually, if you are like me, you probably don’t even realise how much you eat in a day until you start writing it down. It’s can be kind of scary when you first look at it. Dec 2 Date like a gay...get laid like a god. Nov 30 Just Cool Enough Got Nominated!